Section VI of the Draft Report starts with a comparison of prices in states with and without "deregulation." As noted above, the use of this term is misleading, but to the extent the Draft Report is comparing states that have and have not introduced some form of competition, the Draft Report correctly acknowledges the difficulty of making such comparisons. The Draft Report also correctly notes that the states described as "deregulated" had higher rates before introducing competition, and presumably more incentive to introduce competition. Despite these qualifications at the beginning of the section, the Draft Report then goes on to present data from utility groups that similarly lump states together as "regulated" and "deregulated" when the "deregulated" states have forms of restructuring that vary greatly and mostly do not fit the definition of Full Deregulation from Section IX of the Draft Report. When Michigan businesses and potential employers are making decisions on where to locate, and Michigan residents are considering relocating to a state with lower costs of living or better job prospects, they probably are not basing their decision on whether a state has regulated electricity rates. Instead, to the extent that electricity prices affect cost of living and costs of doing business in a state, what matters is how those rates compare with those in other states, and especially the states in the same region. Indeed, part of the lore surrounding the initial passage of electricity choice legislation in 2000 is that the 1997 decision by Northstar Steel to locate a plant near Toledo, just over the Ohio border, due in large part to lower electricity costs in Ohio, is the event that triggered much of the momentum for the electricity restructuring legislation. The Draft Report includes comparisons between Michigan and the national average for rates in all categories and residential rates. It also jumps between the residential rates and the rates across customer categories in ways that do not show a useful picture of how Michigan rates compare across customer categories. 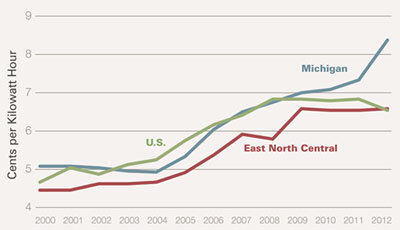 In 2000, Michigan electricity prices were high relative to other states. The Energy Information Administra-tion, part of the U.S. Department of Energy, tracks retail electricity prices for several categories of customers, the most important of which are industrial (e.g., manufacturing plants), commercial (e.g., retail stores) and residential. As shown in Graphic 1, before competition was introduced, Michigan's electricity rates across all categories were 5 percent higher than average prices in the rest of the nation and 11 percent higher than the average price in the Great Lakes States. By 2004 — only two years after competition was introduced — Michigan rates were below the national average and were narrowing the gap with the other Great Lakes States. After the 10 percent cap and other restrictions on competition were imposed in 2008, rates increased much faster than the national average, and by the end of 2012, rates in Michigan were about 18 percent above the national average and 23 percent above the regional average. Furthermore, while electricity rates on average in the United States had declined between 2008 and 2012, rates in Michigan on average were about 27 percent higher than they were when the 10 percent cap was imposed. This perspective may not tell the entire story. P.A. 141 [the 2000 electricity choice legislation] included a five percent rate cut and a rate cap until late 2005. The rate cut may have placed Michigan below the national average and the rate cap may have kept Michigan below the national average. After the rate cap expired, Michigan's rates rose extremely fast and four years later would exceed the national average. Graphic 3 shows the historical trend for residential rates and does indeed show Michigan residential rates rising after the cap was lifted. However, Michigan industrial and commercial rates were never subject to a rate cap, and these sectors consume about two-thirds of the retail sales of electricity in Michigan. Thus, the Draft Report errs when it implies that the historical rates for all categories of customers was subject to a rate cap. Moreover, industrial and commercial rates in Michigan also declined between 2000 and 2004, by about the same amount as residential rates. Even without a rate cap, these categories of Michigan rates fell below the national average, and were falling relative to the regional average from nearby states (see Graphics 4 and 5). Thus, this price data provide no support for the asserted interpretation that the rate cap was driving the drop in Michigan rates at a time when rates elsewhere were rising. Rates in two of the three major customer categories were falling even without a rate cap. Although no market test is available for the residential category, these rates probably would not have risen and may have declined by about the same amount without the rate cap. The state's renewable energy standard, which has been phased in since 2009, may have also contributed to higher prices, including a surcharge currently in effect to fund generation of electricity from certain renewable sources. It should be noted, however, that neighboring states and most other states have renewable energy standards similar to Michigan's, so the current renewable energy mandate is at most a small factor in explaining why Michigan's rates are rising relative to other states. One might note that even though Michigan rates were below the national average until at least 2009, the increase in rates in Michigan started about 2005, or three years before the 10 percent cap was imposed. Various actions by the MPSC between 2004 and 2007 impeded the emerging competition in electricity in various ways, and the regulatory uncertainty during that time almost certainly discouraged entrants from investing in Michigan at a time when the large utilities were lobbying (successfully, as it turns out) for protection from competitors. Another important factor in explaining why both competition declined and rates rose in Michigan, as well as in surrounding states and the U.S. as a whole, beginning about 2005, is the unusual spike in natural gas prices that occurred at this time. 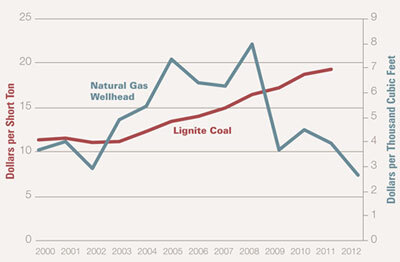 Many of the early entrants in 2002 to 2004 were selling electricity generated from natural gas. Natural gas prices had been low and relatively predictable for over 20 years before 2005, but from 2005 to 2008 natural gas wellhead prices spiked to their highest level since before they were deregulated in 1984. 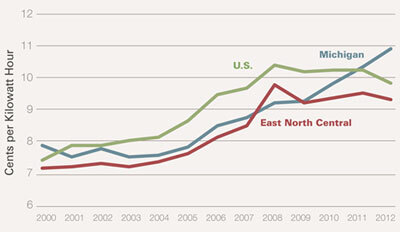 The market adjusted, however, and natural gas prices have since declined to their lowest levels in more than a decade. At the same time, coal prices are now much higher than they were a decade ago, so that natural gas is even more attractive in terms of cost (not to mention emissions) compared to coal. Thus, Michigan timed the 10 percent cap to take effect just as natural gas became an attractive alternative for electricity generation, and other states that allow competition without a cap are receiving the benefits that Michigan has missed. The Draft Report's attempt at attributing Michigan rate increases to the expiration of the 2005 rate cap on residential customers does not hold up under close examination. While the Draft Report is correct in pointing out that Michigan rates began to rise before the 10 percent cap was imposed in 2008, it fails to note how that increase in Michigan rates between 2005 and 2008 is consistent with rate increases in other states at that time. 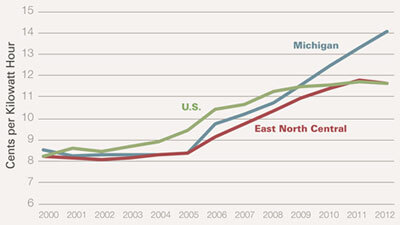 Where Michigan rates diverge from those in other states is after 2008, after the 10 percent cap was imposed. As shown in Graphic 1, since 2008, average rates in the United States actually dropped slightly from 9.74 cents per Kilowatt hour in 2008 to 9.65 at the end of 2012. During the same time period, Michigan rates increased over 27 percent, from 8.94 cents per Kilowatt hour in 2008 to 11.37 at the end of 2012.The major change in Michigan regulatory policies that explains why Michigan rates shot up while national rates stayed the same is the arbitrary cap Michigan imposed on competition, with the predictable result of less competition leading to higher prices. The EIA tracks average electricity rates for the East North Central Region, which is Michigan, Indiana, Illinois, Ohio and Wisconsin. This region is called the “Great Lakes States” in this comment and the graphics. Author’s calculations based on “Annual Electric Power Industry Reports (EIA-861 Data File)” (U.S. Energy Information Administration, 2013), http://goo.gl/0TJ8fs. 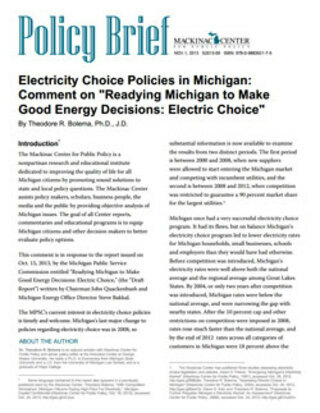 Diane S. Katz and Theodore R. Bolema, “Proposals to Further Regulate Michigan’s Electricity Market: An Assessment” (Mackinac Center for Public Policy, 2008), accessed Oct. 29, 2013, http://goo.gl/CKqEhn. Author’s calculations based on “Annual Electric Power Industry Reports (EIA-861 Data File)” (U.S. Energy Information Administration, 2013), http://goo.gl/0TJ8fs; “Electric Utility Sales and Revenue - EIA-826 Detailed Data File” (U.S. Energy Information Administration, 2013), http://goo.gl/vwbx5y.